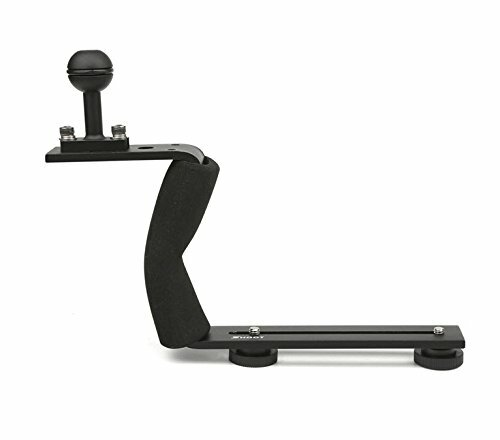 This Aluminium diving handle by AXIONTM is designed as a universal light mounting system.The foam cushioned handle with 1" ball adapter on top allows installation of a video/strobe light. Anodized aluminum construction for light weight and durability. Comes with 2 standard screws for attaching to underwater housing. Compatible with many housings such as Meikon,Ikelite, Sea&Sea, Fantasea, for Canon G11/12, G15, G16, G1X, G1X II, G7X, 550D, 600D, 650/700D, S100, S110, S120. A5000/5100, A6000, A7(7S/7R), A7 II(7S II/ 7R II), NEX (5/5N/5R/5T/6/7), RX100 (II/III/IV) and many more. If you have any questions about this product by Axion, contact us by completing and submitting the form below. If you are looking for a specif part number, please include it with your message.